Body of Christ n.6 21 cm. Resin body of Christ n.13 85 cm. Body of Christ n.4/B 12 cm. Body of Christ n.3 9 cm. Body of Christ n.9 26 cm. Body of Christ n.5/B 18 cm. Resin body of Christ n.18 180 cm. Risen Christ on cross (171) 25x13 cm. Resin body of Christ n.12 95 cm. Body of Christ n.7 16 cm. Risen Christ (172) 17 cm. Risen Christ (171) 12 cm. 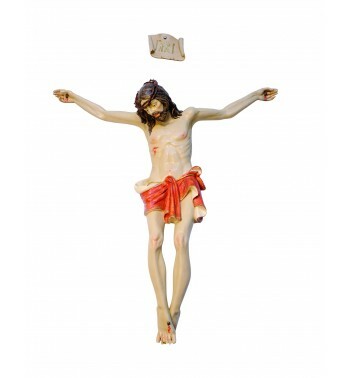 Resin body of Christ n.10 50 cm. Resin body of Christ n.14 135 cm. Body of Christ n.8 21 cm. Risen Christ on Cross (172) 30x17 cm.